In light of this week’s announcement that Tesla has chosen Northern Nevada as the site for its new $5 billion battery “gigafactory,” it seems timely to recall the state’s long history of luring residents and potential investors with its unparalleled tax advantages. 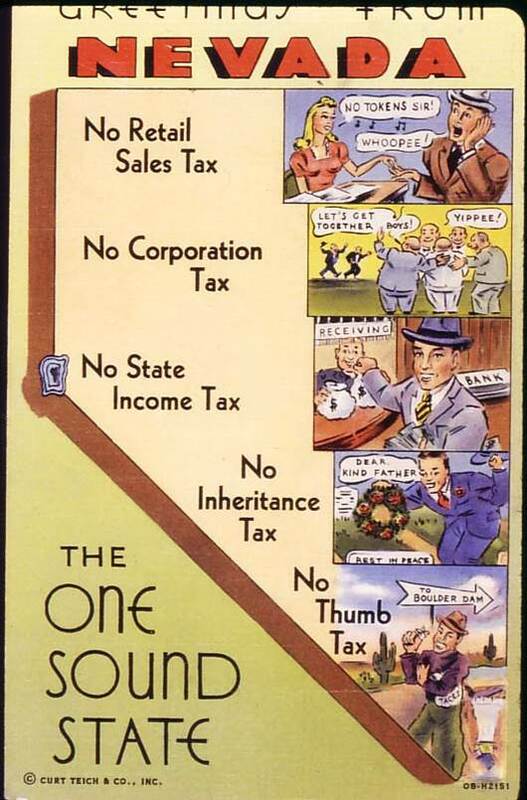 Perhaps the most well-known attempt was the “One Sound State” campaign of the 1930s, which hoped to attract wealthy new residents to Nevada by promoting it as a conservative tax haven. The One Sound State campaign directly targeted more than 10,000 wealthy individuals, suggesting they move to Nevada for tax purposes. As a promotional strategy, the “One Sound State” campaign was driven largely by local concern that the only Reno most Americans knew was the image purveyed by the media–as a capital of gambling and divorce. Its strategy was to convince the very wealthy of the state’s economic “soundness” by stressing the lack of numerous taxes, from state income tax to inheritance taxes. So did it work? Undoubtedly. Numerous millionaires moved their residences to Nevada, although many clustered around the shores of Lake Tahoe in elegant homes far removed from Nevada’s urban centers. The long-term benefits to the state are difficult to calculate, but one point is clear: the charitable foundations founded by some of those millionaires and their heirs (among them, Max C. Fleischmann, E.L. Cord, Wilbur D. May, Nell J. Redfield) have injected hundreds of millions of dollars into the state’s educational system, cultural institutions, and non-profits. If you’re in Reno, you can learn more about these millionaires and their foundations at the Wilbur D. May Museum at Rancho San Rafael Park in an exhibit on display through September 21st called “Rush to Reno: Millionaires in the One Sound State.” For more info, visit the museum’s website. So will the massive tax breaks and incentives offered to Tesla come back to benefit Northern Nevada a hundredfold? Only time will tell. It’s a major achievement, and also a leap of faith. But that’s Nevada, land of the eternal gamble. You really can’t expect this state to operate any other way.